Sakai Guides and DocumentationSakai Complete User Guide Tests and QuizzesHow do I create a survey? 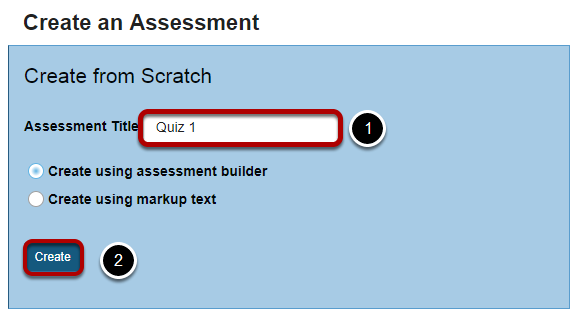 The Tests & Quizzes tool may be set up to deliver surveys as well as other types of assessments. 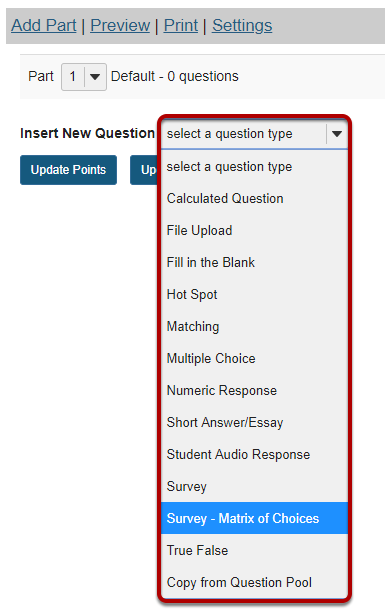 Survey question types may be added to a new or existing assessment. There are two types: a basic survey and a matrix of choices survey. Tip: If you are delivering a survey, you may wish to set the assessment to anonymous when publishing the item, so that your survey responses will be gathered anonymously. See How do I view and modify the settings of an assessment? for more information on delivery options. The Answer Point Value will default to zero. Because basic surveys are not typically scored, the answer point value will default to zero. This setting cannot be changed. 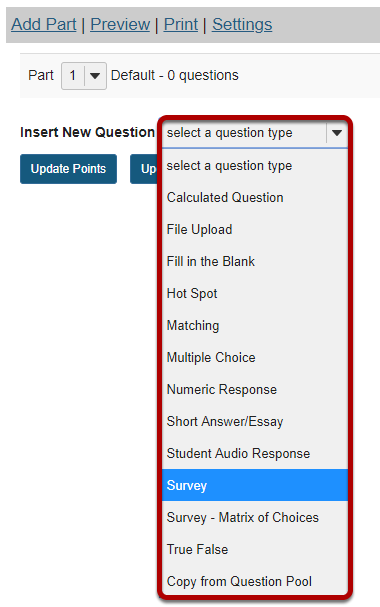 Select the radio button to determine whether or not students will see the point value as they are taking the survey. 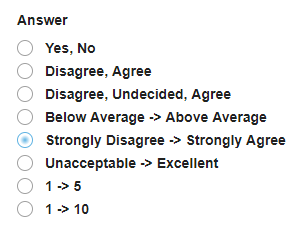 Since this type of question is not typically scored, No is the recommended selection. Select the desired answer format from the list. Feedback is optional text available for students to view. There is a field for the Answer Point Value which may be edited. However, it is recommended that you leave the default value of zero, since this question type does not have a way to designate the "correct" answer selection and therefore cannot be automatically scored. Input the desired choices for Row Choices and Column choices in the corresponding boxes. Press Return after each choice to separate the items. Check the box for Allow Only One Response per Column if forced ranking is desired. Check the box to Add Comment Field in the survey if desired. The drop-down menu is available to regulate column and row width. The widths are based in percentages. Prev: How do I create a hot spot question? Next: How do I create a student audio response question?